As a Wilderness Survivalist, I will help you learn techniques that are vital to survive in the wilds of the world. First of all, you need to believe in yourself. Self-belief is of utmost importance. The human body is capable of withstanding treachery but it is the mind that can weaken the body. No matter what the odds, you must believe in your ability to survive against all odds. Once you give up on yourself, you are fighting an uphill battle. Photos: Dave Canterbury and Kellie, Kellie and Billie Berger, Kellie climbing cliff, Kellie eating survivalist foods. To aid in your survivability; practice survival skills before you need them. Water, Shelter, and Food are the most important items that aid in survivability. A sharp knife is one of the most important of all survival tools. It can be used in a plethora of different manners such as: to hunt via spear, to spear fish, to create an atlatl, to cut down trees for shelter, to make traps, to butcher, to collect edible plants and medicines, to collect tree bark and or fibers and roots, to use as a hammer, to cut firewood and on and on. Another extremely important survival tool is a firestarter. I carry five different fire starting methods in my survival gear. With a knife, a fire can be started by making a bow drill, hand drill, or friction fire starting set. These methods can be very difficult even in dry conditions. It is always better to have varied fire starting methods with you in your survival kit / survivalist kit. Fire can be used to purify water, to cook with, to keep warm, to ward off dangerous animals, to dry clothing, to harden wood implements, to smoke meat, to keep you company, and give you piece of mind to name, just a few. One of the most important things to aid in your survival is to have a supply of drinking water. Unpurified water should be boiled or at least heated to purify unless you are in eminent need of it. Unpurified water often contains microscopic parasites among other non-desirables. These unwanted guests can lead to diarrhea along with other ailments that could lead to dehydration and even death if not treated. One of many ways to purify water is to make a container to boil water if you do not have one in your survival gear. You can make a container to boil water with a knife and a piece of green wood. You will need to hollow out the center of the wood to make room for the water. The best way for harder woods is to lay a log on its side on hollow it length-wise. If you are lucky enough to be in a bamboo climate then you already have a hollow vessel. Make do with what you have in your area. If you have basalt or other hard rocks in the are then heat them with a fire and place them in the hollowed are to expedite the boiling process. If not steel can be used if you find any. A knife can be used but it will lose its temper; weakening it. A quicker way to purify water is via the transpiration method if you have clear plastic bags in your survival kit. Take a bag and tie it tightly around a tree with leaves or needles. The transpiration produced by the living tree sucking water out of the ground too its leaves or needles will provide you with a nutritious drink full of vitamins with in six to eight hours. Obviously, don't use a poison tree like poison sumac or poison ivy. Contact me for further information on this method. Click here to learn more about Water Purifation. Food can be easily found if you are familiar with edible plants. Gather these wild edibles and make natures' salad or steep with purified water for an herbal tea or soup. Some insects are edible but you must know what one are poisonous or that contain parasites before eating. Parasites can be killed by cooking. Some tree leaves and roots and fruits and bark are edible if you are educated in this area. Food can also be acquired through making primitive traps and snares if you have wire or rope or natural cordage. Read and watch my you tube videos or contact me to learn more about traps. Food can be hunted for and fished for with the ability to have aid tools in a survival kit or the ability to make tools to aid in hunting and fishing. Another important item to carry in your survival kit is "bank line" and "para-cord.". If you don't have these available other rope and or snare wire is better than nothing. 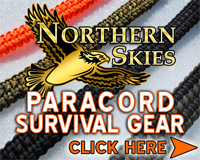 I will explain the benefits of bankline and paracord in an upcoming You Tube Video. There are hundreds of types of Primitive Shelters you can build. You can see hundreds of how to videos on You Tube. I have a few simple methods showcased in my videos. There are also numerous books and written material you can find on shelters online. To view my Youtube Video on Primitive Shelters, please click here. I recommend building a primitive shelter in your backyard and sleeping in it. Learn what works for you. Contact me for further advice on shelter building. These are just a few quick survival tips. Stay tuned for many more written and video tips to come. 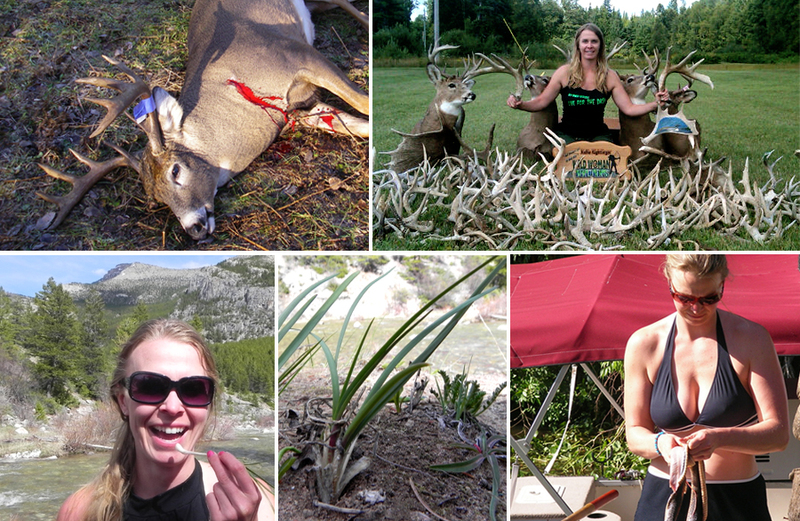 Get to know Kellie even more by learning about her incredible "Buck List"! Click the learn more button to see the many adventures that Kellie will be pursuing in the near future!